This 1959 Gran Premio is one of those rare finds that has remained unaltered for almost 60 years. During the winter I received an email from Craig and Tina Davis of Bolton, Ontario with a few questions about this Legano and an invitation to come and have a look at the bike that belonged to Tina’s late father, Harold Karnotski. Harold came to Canada in 1955 and was a long-time resident of Scarborough, Ontario. If a reader recalls having known Harold, I would enjoy hearing from them. Now that the snow has pretty much left Toronto for another year, I hopped in the car this week and drove up to meet Craig and his wife and take a closer look at this vintage Legnano. I could tell from the photos that he sent me it was in excellent condition and had been well loved over the years. As it turned out, Craig and his wife had decided to part with the bike and wanted to know its value and if I was interested. I already have quite a number of Gran Premio models from this time period in the collection however the complete originality of this bike was too much to pass up. I gave Craig an honest opinion of what the bike could fetch if he wanted to post it on eBay and we settled on a price that was fair in both our minds followed by the customary hand shake. In addition to the originality of this Gran Premio, from my years of collecting the overall condition of this Legnano is as good as it gets. The lack of corrosion or pitting of the chromed surfaces indicates it was kept indoors during the off season and the typically fragile ‘lizard yellow’ lacquer paint finish is in excellent condition. So a very ‘conservative’ restoration is all that is planned for this Legnano. When I get the time I will fully disassemble the bike followed by a careful cleaning of all the parts and repack the bearings. Some new bar tape is required, the Universal brake hoods will be replaced with NOS parts, a fresh set of tubular tires and that will be pretty much it from the look of things. 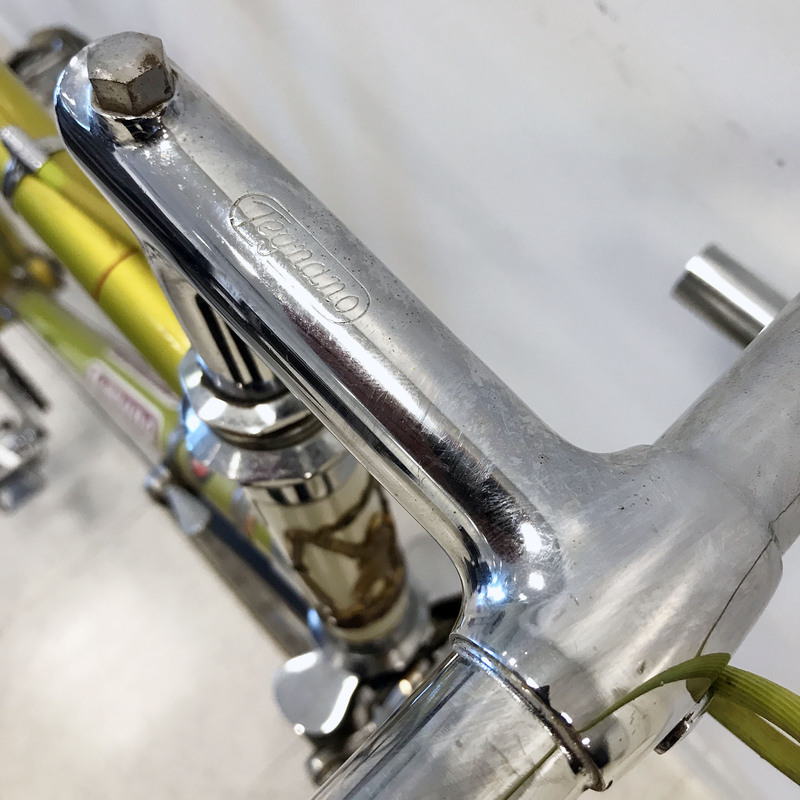 Here are a some additional pictures of the bike and a good point of reference for anyone restoring and searching out the bits and pieces for a late 50’s Gran Premio. 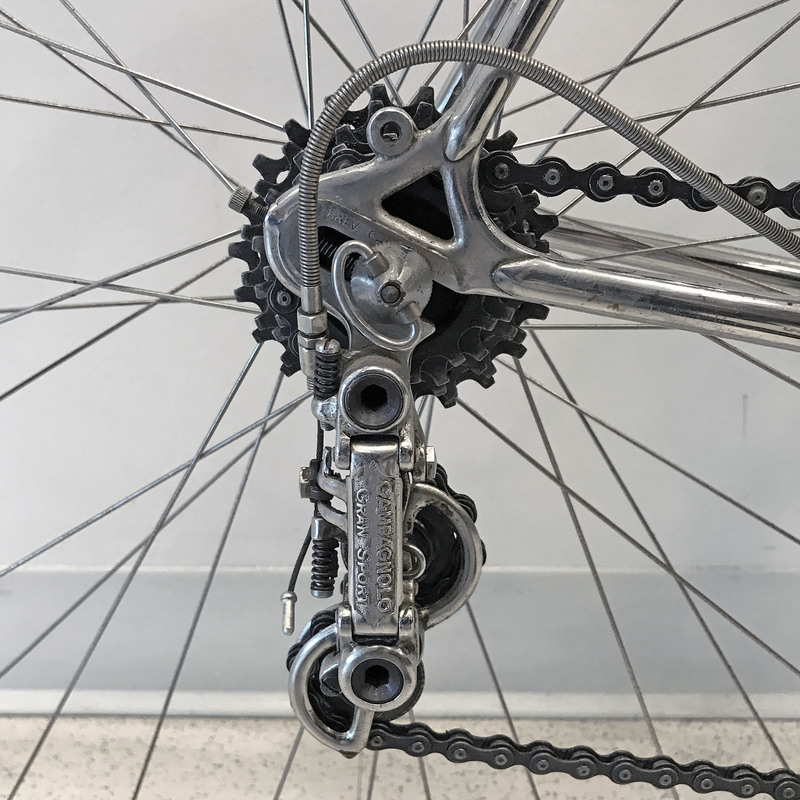 I believe this is the 4th generation Gran Sport rear derailleur (c.1956) that was first introduced in 1950 by Campagnolo, and the rest as they say is history. 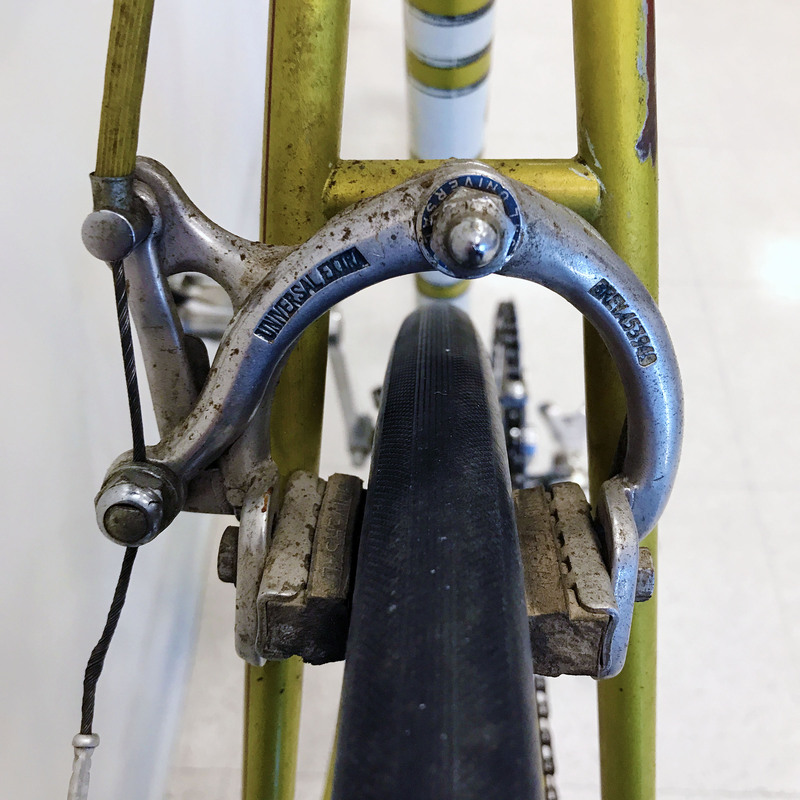 The ubiquitous Gran Sport ‘matchbox style’ front derailleur as it is often called was fitted to both the Gran Premio and Roma Olimpiade. When the Campagnolo Record front derailleur was introduced in 1960 the Roma Olimpiade was upgraded. 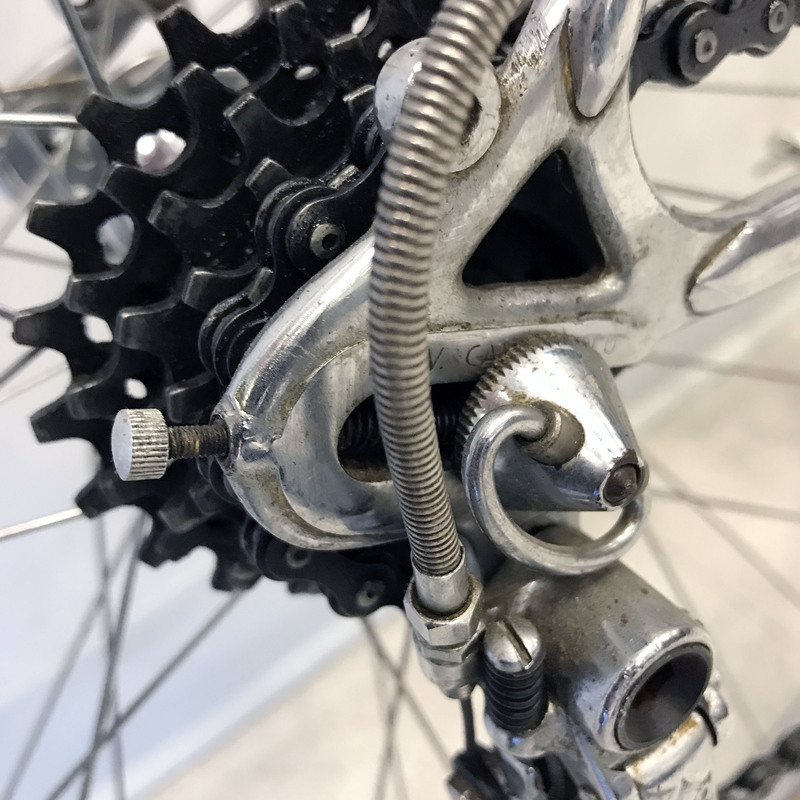 All of the nuts and bolts on this bike show very little wear or damage, suggesting the bike was serviced over the years by an experienced mechanic with proper tools. 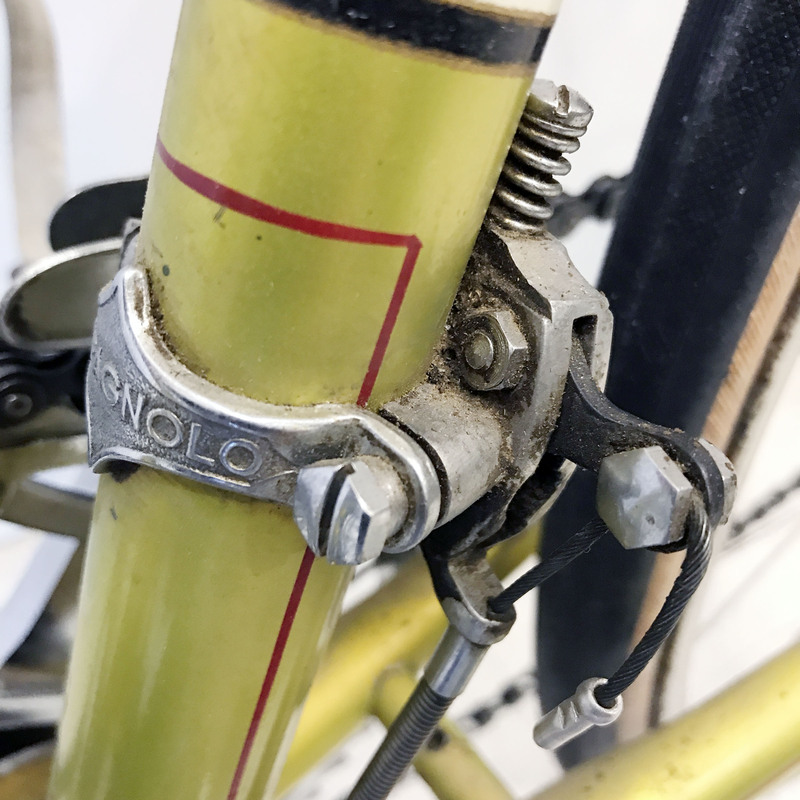 The ‘Gran Sport’ downtube shifters feature the open ‘C’ lettering in the Campagnolo workmark that I understand was changed to a closed ‘C’ about 1963. Something about these early pump pegs that are almost Victorian in their design and they have always appealed to me. This photo shows the pre-1960’s ‘Made in Italy’ decal that Bozzi SpA used. 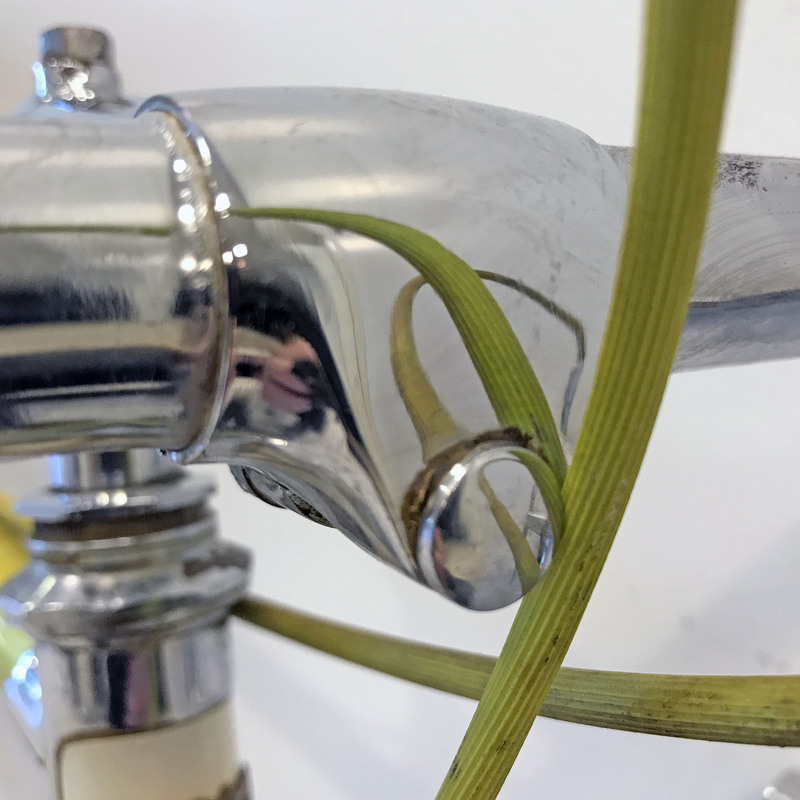 The above photo also shows the chrome plating is in excellent condition with very minimal pitting suggesting the bike was well looked after and stored in a dry place during the Canadian off season. It is often a quick assumption that all Legnano road bikes during this period were fitted with Magistroni steel cranks. Given the almost identical designs from Magistroni, Gnutti, Way-Assauto and F.B., it is an easy oversight and one I have made myself. 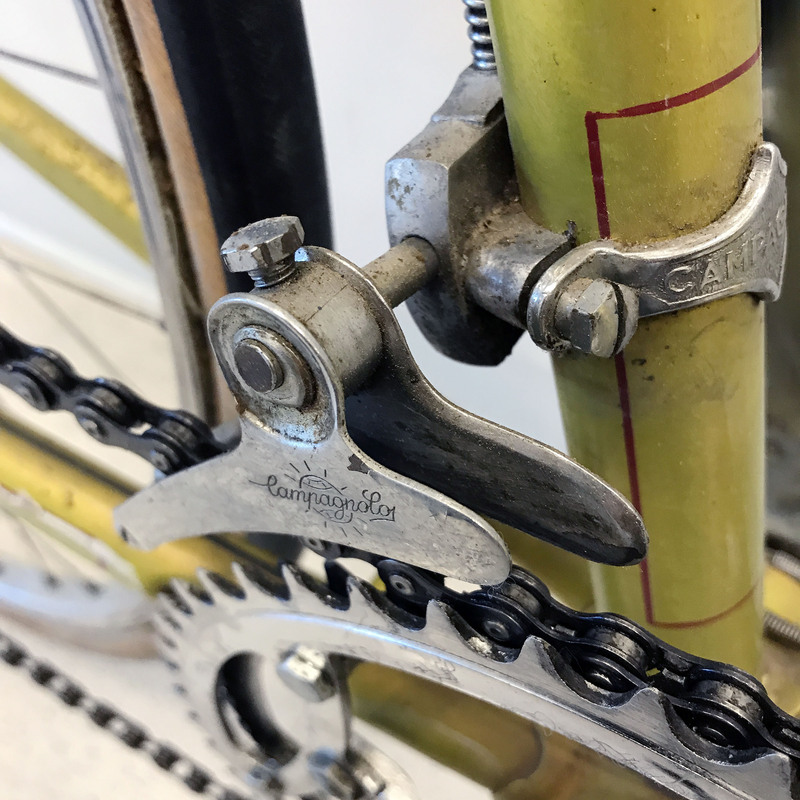 However these cranks and the bottom bracket are from Way-Assauto and can be defined by the ‘arched’ or rounded spiders on the chainrings versus the angular design of the spiders on the other aforementioned brands. It would seem from my collecting and research that Emilo Bozzi SpA had a very strong supplier arrangement with Way-Assauto from very early on as W.A. components are widely used on many Legnano road and city bikes. 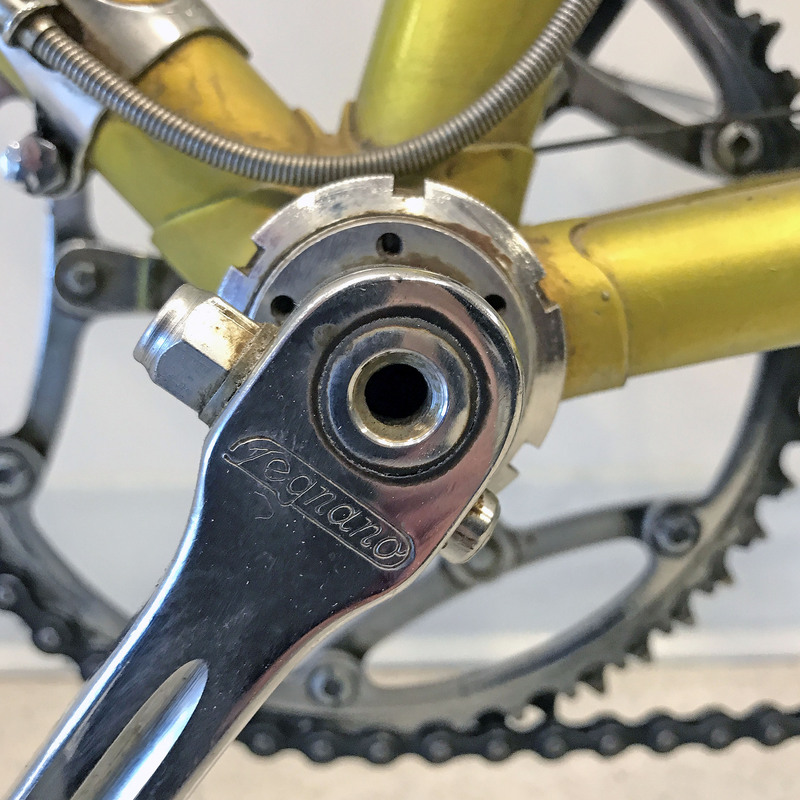 Magistroni cranks are more commonly found on the top-of-the-line Roma model during these years, often fitted with the Simplex (Italy production) aluminium chainrings and forged steel spider brackets. Starting about 1958 and leading into the 60’s, Legnano began fitting the new Campagnolo Record aluminium crankset (151mm bolt circle) to their top Roma Olimpiade Campagnolo model. The original, hollow factory cotter pins are still in place on the crank arms. 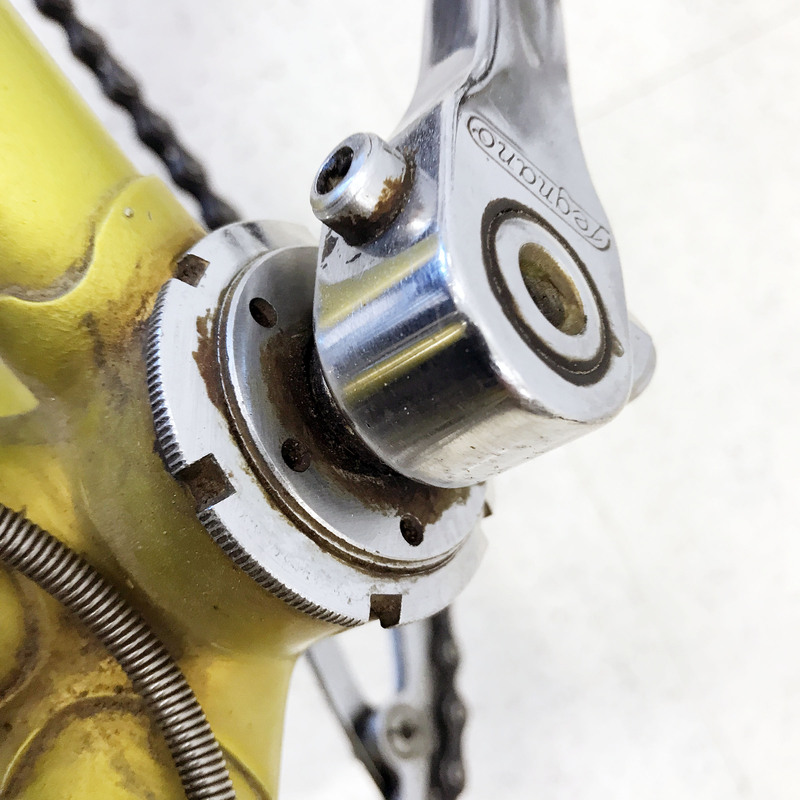 The pristine condition of the bottom bracket lock ring also suggests it may not have been removed or at the very least by a proper mechanic with correct tools. 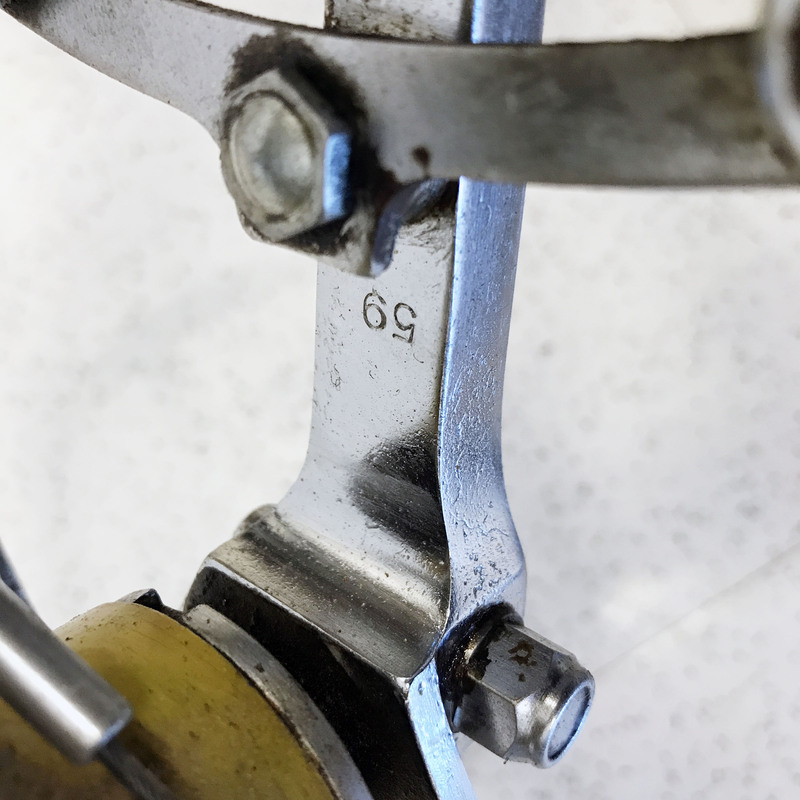 1959 production year stamped on the inside faces of the crank arms. 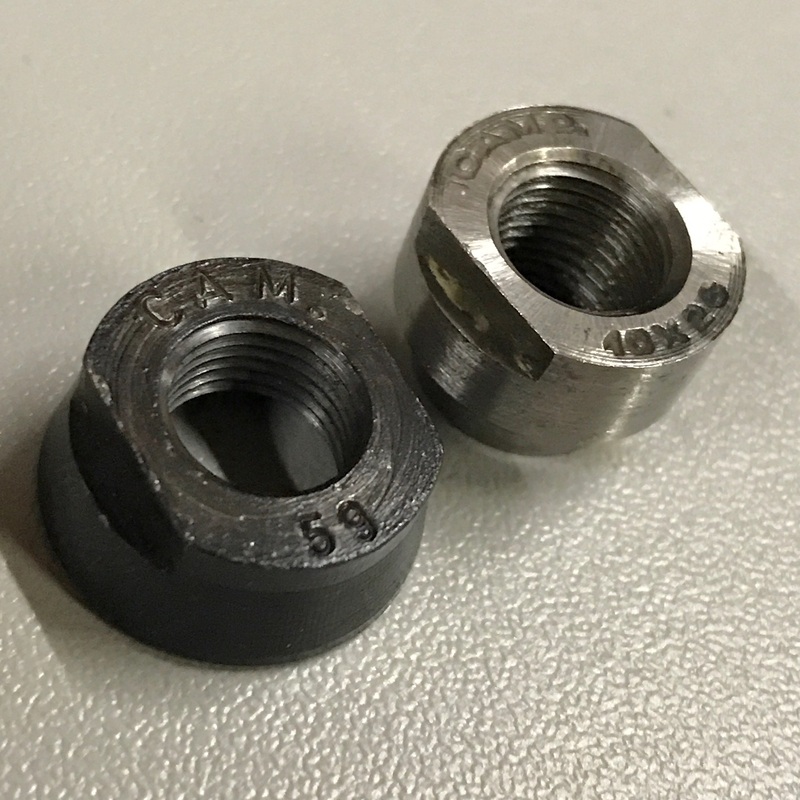 Matching 1959 date stamps on the front and rear lock nuts. 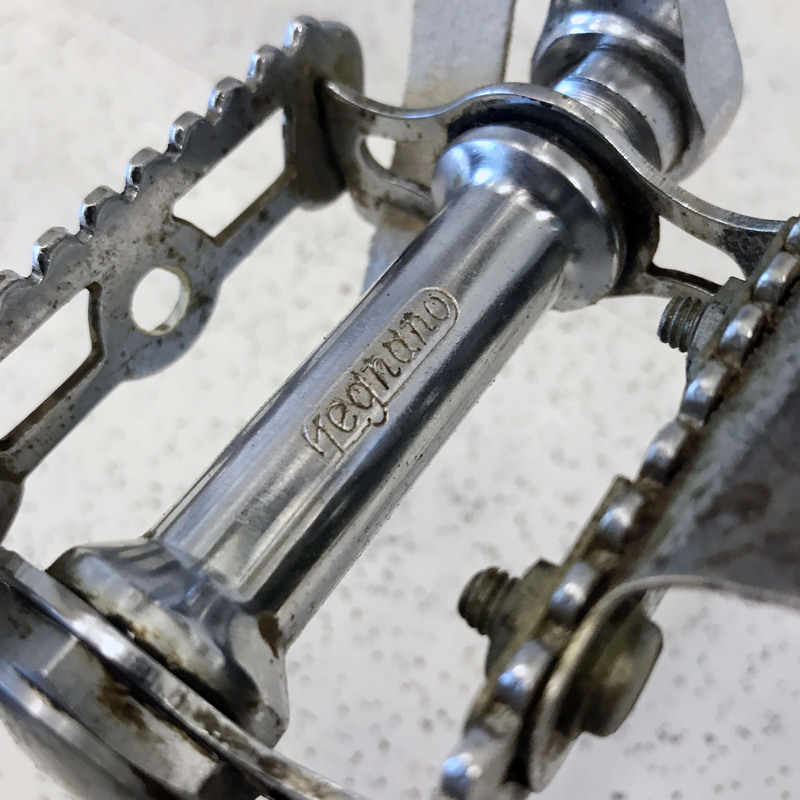 The pedals are the ‘Sprint’ model from Way-Assauto branded with the Legnano logo on the barrels. Toe clips are from Christophe and possibly added by the shop when the bike was purchased as opposed to factory fitted. Universal Mod.51 sidepull brake callipers were common to both the Gran Premio and the Roma Olimpiade models until the Universal Mod.61 centerpull callipers were introduced in 1961. 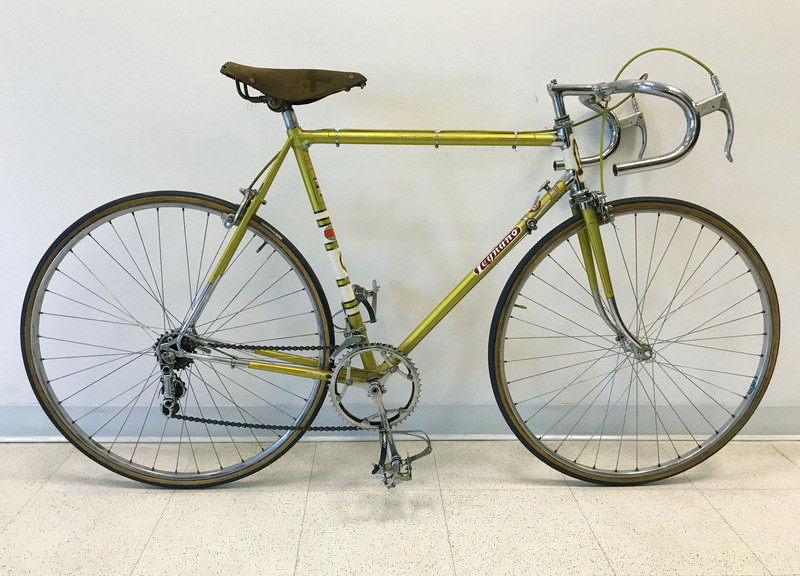 This 1959 Gran Premio, as well as the 1958 Gran Premio on this site, is fitted with a Cinelli steel stem and steel bars that is branded on the neck with the Legnano logo. 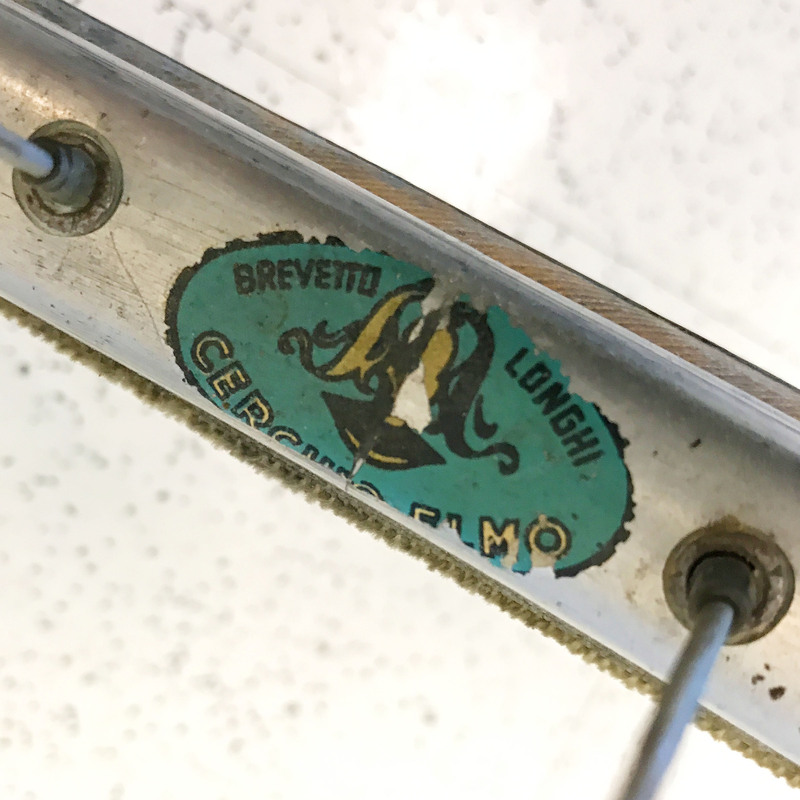 The older oval Cinelli logo is stamped on the underside of the stem. From my research and collecting, it seems that Legnano switched to the Ambrosio F.T. 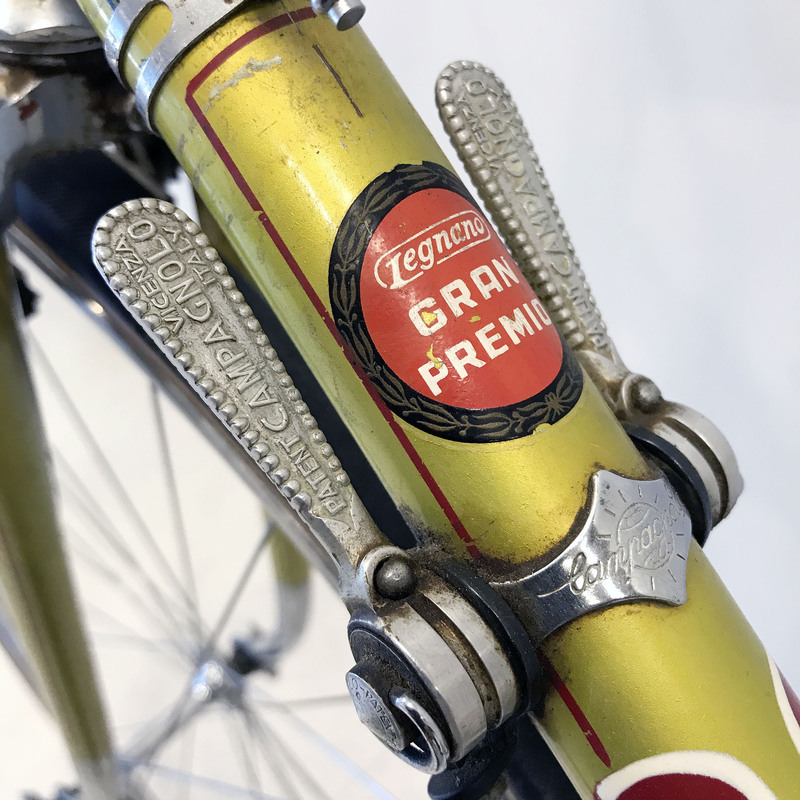 aluminium stem and bars for the Gran Premio model starting in 1960. 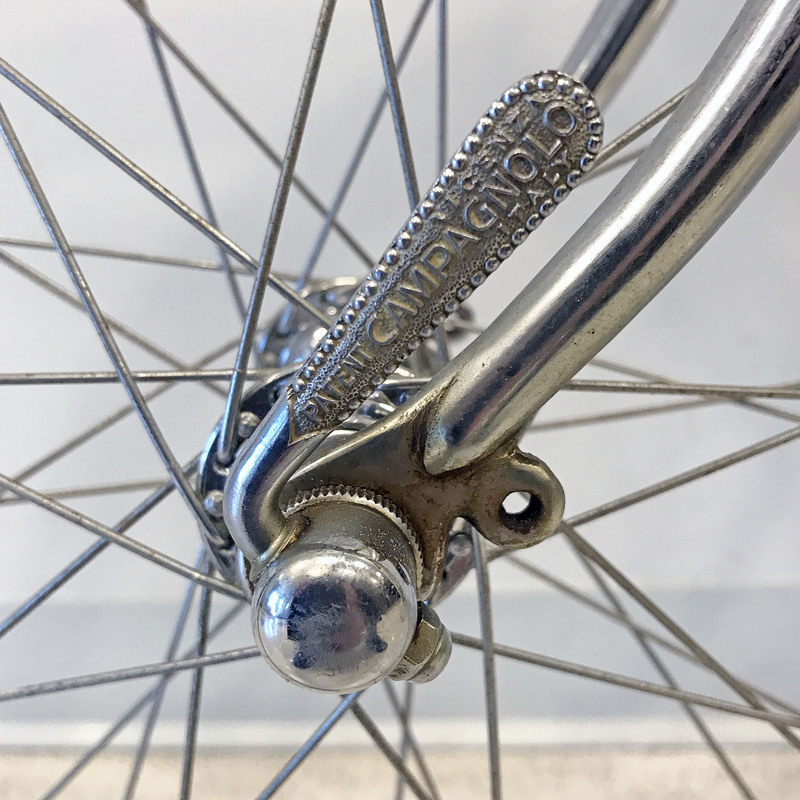 Prior to 1960, most Gran Premio models were fitted with the Campagnolo steel ‘Sport’ hubs branded for Legnano on the barrels rather than the 3-piece, low flange ‘Gran Sport’ hubs that were fitted to the top-of-the-line Roma Olimpiade. 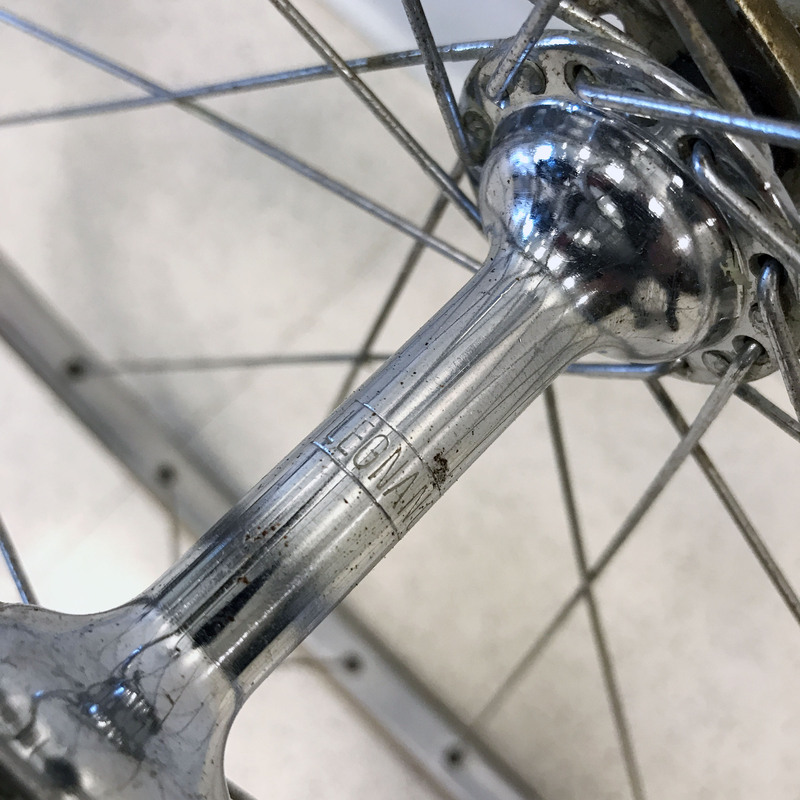 Through most of the 1960’s the Gran Premio and the Roma Olimpiade shared the one-piece, high flange aluminium Record hubs that Campagnolo introduced in 1958, also branded for Legnano on the barrels. 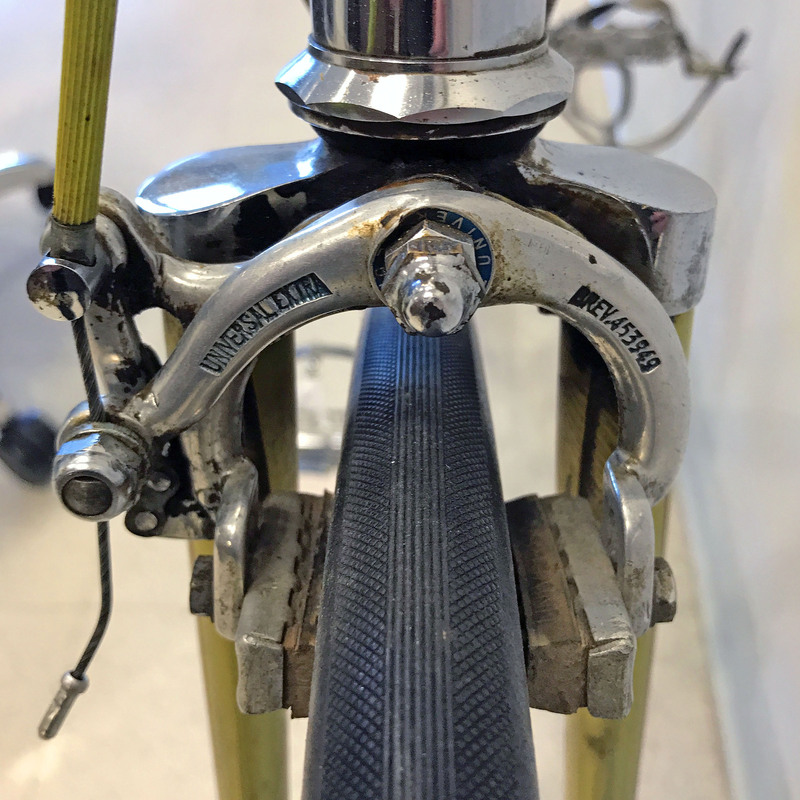 And lastly, the green label ‘Cerchio Elmo’ tubular rims from Fiamme were common to most Gran Premio models during this era with the lighter red label tubular rims fitted to the Roma Olimpiade. Gran Premio models shipped to the USA in the early 60’s were also available with Fiamme yellow label aluminium clincher rims and tires to the preference of some customers. I have started to post the restoration of this 1959 Gran Premio on the bike’s home page, that you can link to here. 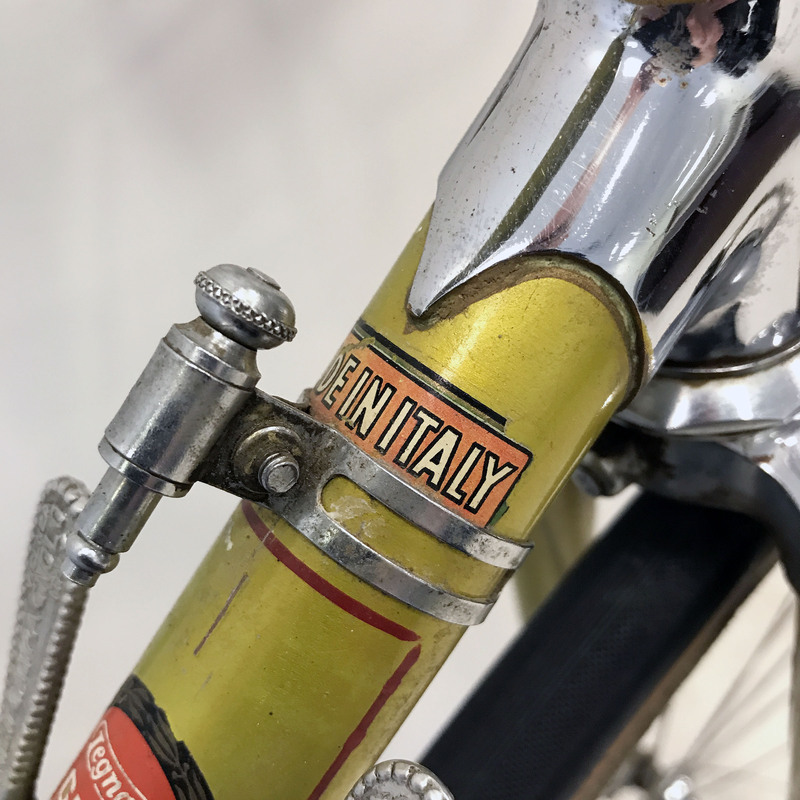 This entry was posted in Emilio Bozzi, Gran Premio, Legnano and tagged #biciepoca, #emiliobozzi, #GranPremio, Legnano. Bookmark the permalink. Mark, sorry for the delay in reviewing the progress on my Father In Laws bike. The detail of your review shows the true compassion you have for these bikes.